Finally, the long wait (OK, it just seems long) for Android 2.2 is coming to an end for many of you. 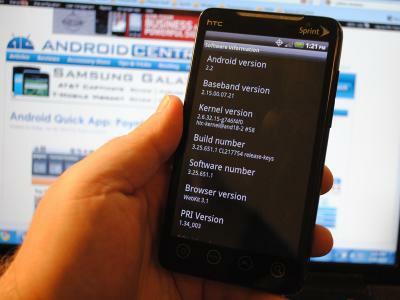 First with the Nexus One, and now the Motorola Droid and Sprint Evo 4G, Froyo is steadily being updated on thousands of Android phones. But we get it. You guys still have plenty of questions about Froyo. And we've got answers. So after the break, some Q&A on everybody's favorite OS update. When is my phone getting Froyo? For everybody else? We don't know. Sorry, but that's just the way it is. OK, so HTC has said it expects to finish its Android 2.2 updates by Christmas. The Galaxy S phones should get it. Same for the Droid X. But other than that? We really don't know (though we have some guesses). But as soon as we do know, you'll know. Ya know? Nope. As soon as we do, we'll tell you. OK, fine. So what do I get with Android 2.2? Chances are you won't really notice that much when you reboot with Froyo for the first time. This isn't a major overhaul to the look and feel of Android. But you will have a slew of new features, the biggest of which are the Just-in-Time compiler (which can double the processing power), and the ability to run Adobe Flash 10.1. Full a better look at what to expect, see our Froyo Features section. So what about these 'unofficial' ROMs I've heard about? Sometimes ROMs are inadvertently released early. Sometimes they're leaked. In the case of the Evo 4G's "unofficial" Froyo update, it was on HTC's servers (which is where everybody got it from), but it wasn't intended for release. Now, an unofficial ROM may look fine and run fine. But On consequence of having installed the unofficial Evo ROM is that you won't get the official update, at least at first. HTC has said it's going to work to get those phones "back on track." But no word on how soon that will be. The basic rule of thumb is if you're willing to install an unofficial or custom ROM, you're taking responsibility for updating your phone later. That's not to say they're evil, just that you might be creating a bit of a headache for yourself. And what about updating manually vs. over the air? We get this one all the time. When you update your phone manually, you download the update file. You put it on the phone, and you put the phone in recovery mode and initiate the update. The only difference in an over-the-air (aka OTA or FOTA) update is that the phone does all this automatically for you. That's it. So long as the files are the same (and chances are you manually downloaded it from the official server), then there's really no difference. Repeat: Only the methods are different. One's no better than the other, or more dangerous, or will bring the update police to your doorstep. What if I've already rooted my phone? Will I lose root? Will I not get the update? If your phone is rooted -- and only rooted -- you'll most likely get the update, though you'll lose root access. If you have a custom ROM installed, you're most likely not going to get the update. Of course, if you have a custom ROM installed, chances are you're not worried about getting the official update. Can you root again after the update? Erm, that depends if exploits have been closed. Best thing to do if you have to have root is to wait for a rooted ROM to be released. And we're already seeing some. Will I lose all my apps? Do I have to buy them again? Absolutely not. Assuming all goes well with the update (and we have every expectation that it will), everything should be as you left it. Yep. They should still be there. We recommend having everything sync'd to your Google account, just in case, but the update shouldn't touch any of your personal data. What if an app doesn't work? First thing we'd recommend is to hit uninstall and reinstall the app. Then hit the Android Central Forums and see if others are having the same problem. Then we'd contact the developer. Last resort would be to wipe the phone and start over. What about installing apps to the SD card? So here's the deal: Froyo provides the framework to install apps to the SD card. But it needs to be coded into the app in order to work. And not every app has been updated yet. And another thing: If you install an app to the SD card, any corresponding widgets likely won't work. That's just the way it is. Oh, and another thing: If your phone's SD card is mounted to your computer as a disk drive, anything installed on it is going to be unavailable. Just the way it is. It depends on your data speed. But it should just be five or 10 minutes from the time you get the update notice. It'll download in the background, and then your phone will reboot into the recovery mode and apply the update. Do I need to do anything before I get the update? Nope. Best thing you can do is keep your phone charged. Great! So, when will I be getting Froyo? Thought you could trick us, eh? We still don't know.